What makes a YouTube channel successful? What characteristic a YouTuber should have to become successful? The Next Generation YouTubers are having unique characteristics and created varying content for the audience. 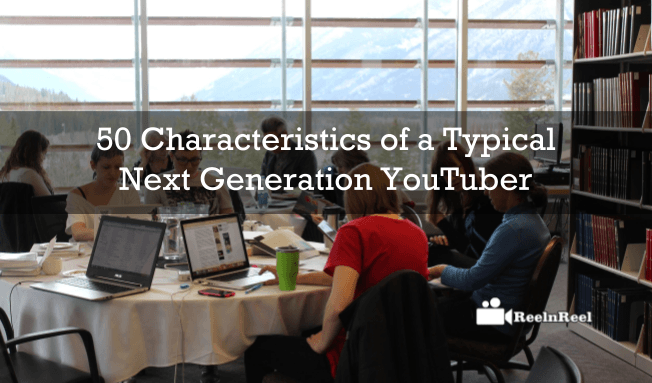 Here are the characteristics that Next Generation YouTuber exhibit. 1. One of the important characteristics for next-generation YouTuber is to follow a regular uploading schedule. 2. The YouTubers stick to the schedule and never alter it. 3. The YouTubers must decide how often they can make the videos and most important is to stick to it. 4. YouTubers must interact with the viewers on social media. 5. They should ask the opinions of the viewer, reply to their comments and take feedback from them. 6. Make the fans a part of the video community. 7. The YouTube channel community which is strong and responsive plays an important role in the growth of any channel. 8. YouTubers must have characteristic is to engage the audience. 9. The audience must be made to feel that they are part of the videos. 10. Ask the viewers for ideas for the upcoming publishing schedule. 11. Social media is a powerful tool and this is where next generation YouTubers are promoting their videos. 12. Twitter and Facebook are the two popular options that can be used as social media outlets. 13. Twitter is one of the social media platforms on which next gen YouTubers for going viral. 14. Having an own blog is another tool for promoting the channel. 15. Behind the scene photographs, video inspirations are posted on these blogs to increase the engagement levels. 16. Give the link of the YouTube channel on your social media descriptions. 17. A pinned tweet can be used to showcase the latest video in the channel. 18. A pinned tweet shows the latest video first to the people who are visiting the profile page of the YouTubers. 19. Use YouTube channel branding. 20. Next gen YouTubers use logos for branding the channel. 21. They may use a unique video which is specific to the channel and the music reminds of the channel whenever they hear it. 22. For the success of the YouTube channel, building a brand is important. 23. Building brand leas to increase in viewership. 24. To get the loyalty of the viewer, offer some gifts to those who make the best comment. 25. The YouTubers can offer the T-shirts they are wearing or the product they are reviewing etc. 26. Offer special gifts to the viewers based on the type of videos that you make. 27. Another characteristic the YouTubers must have is to network with other YouTube bloggers. 28. Create videos together with other YouTubers and there will become the most viewed videos. 29. The next gen YouTubers also swap their channels for a week. 30. Exchange mentions apart from creating collaboration video. 31. The YouTubers create videos that viewers can feel personal. 32. Similar content is available online and why the viewers must watch your video is because they are personally connected with them. 33. Next gen YouTubers must understand their audience. 34. Think about the topics that the viewers will be interested in. 35. Get all the specific data about the viewers and then plan the content. 36. Go through the most popular videos and then find what made them liked by the viewers. 37. Make the audience involved. 38. They encourage the audience to give their feedback. 39. As them to comment about the video and share their thoughts. 40. The viewers can also give ideas for the future ideas. 41. They ask the input of the video in outro, video description or in the social media platform posts. 42. Post polls to grow the interest of the audience. 43. The next gen YouTubers also start a discussion in the video comments. 44. Post questions in the comments. 45. The next gen YouTubers ‘success lies in being themselves. 46. Knowing what the people want to see and not to disappoint them by not following the publishing schedule. 47. They do not risk the job or their studies until they are successful on YouTube. 48. Not all the videos in the YouTube channel go viral. So they don’t give up until they taste the success. 49. They listen to the feedback of the audience and react to them. 50. The next gen YouTubers are open and honest with the audience. YouTubing does not require any qualifications. The creators need to be happy in front of the camera but need not have deep knowledge about the subject. Above mentioned are the characteristics the YouTubers must have to make it big.